Hume Riverina Community Legal Service (HRCLS) has joined forces with the Consumer Action Law Centre (CALC) to strengthen its approach to dealing with consumer legal issues faced by people on the Border. HRCLS has entered a partnership with the Victorian-based CALC, along with Barwon Community Legal Service, to work together to identify and address the consumer law, credit law and insurance law needs of clients living in regional and rural Victoria and to provide better access to CALC’s specialist knowledge. HRCLS principal lawyer Sarah Rodgers said the six-month project allowed HRCLS to play a part in the Federation of CLCs’ ongoing campaign to increase access to justice for people and has assisted the service’s lawyers identify consumer problems and help people, particularly those who have been misled and face crushing debt and repayment issues. CALC Lawyers Lachlan Edwards, Philippa Heir and Lisa Grealy have visited HRCLS over the past few months to train staff and establish clear referral pathways to CALC’s expertise. 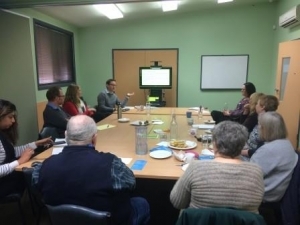 Jesse Marshall was in the region last week a nd was able to provide community worker training in Wangaratta on Thursday 28, June alongside HRCLS lawyers Deb Fisher and Jodie Wells. The topics discussed were Fines, Family Law and Consumer Issues; three common, everyday legal problems. It is hoped that the more community workers are informed about the law in these areas and the services that are available to assist, the earlier people will be referred for the help they need. This work has been undertaken within the framework of a broader project led by the Federation of Community Legal Centres, to improve the interaction between the 24 generalist and 25 specialist Community Legal Centres (CLCs) across Victoria. The Project is funded and supported through Victoria Legal Aid’s Community Legal Centre Innovation and Transformation Fund.